Vietnam’s winter normally starts from November till the end of January or early February and it only shows clearly in the North of Vietnam. This season is believed as the best eating time in the year. As the winter in Vietnam is cold and humid, people here lose a lot of energy to warm up their body, therefore they are always hungry and tend to eat at any time in the day. Besides, different with summer time, when people find it so hard to eat anything hot; in winter, they still can eat everything from hot to cold. As a result, in Vietnam, many winter dishes are not sold in summer, but the cold summer dishes are all sold in winter, which creates the variety of winter cuisine here and makes winter become the most delicious season. 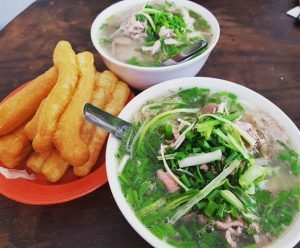 As the choices for food in winter is diverse and varies from the North to the South of Vietnam, we will only suggest some highlight dishes here so if you come to Vietnam this season, just find and try them to experience the yummiest time in this country. Many tourists know about Pho, it is also called the Vietnamese noodles as always be presented as the symbol dish of Vietnam. Pho is available everywhere in Vietnam from the North to the South. However, in different areas, the flavor of Pho is various. While in the South, Pho is served with very sweet broth and has onion inside because the Southern people love sugary flavor, Pho in the North use the broth which is luscious (naturally from animal bones) and a bit salty at the same time and does not have the onion inside (as it is a Western ingredient and Pho in the North was born before this ingredient became popular in Vietnam). In a cold winter morning, Pho is the top choice for any people to warm up their new day. Waking up soon and have a bowl of Pho with white thin noodles served in hot broth with some slides of beef or chicken and a little green from scallion on top, you will be addicted with this dish. Besides, for anyone want to taste more flavors and love crunchy things, you can also order some tiny Yau Ja Gwai – a dish come from China and was changed slightly when it came to the North of Vietnam, it is amazingly suitable with most of noodle dishes. But Vietnam does not only have Pho, it also has Bun (vermicelli) and Mien (glass noodle), two other famous types of noodle here. Compared with Pho, the dishes with Bun and Mien are more varied as they can combine with beef, chicken, pork, fish, seafood, mushroom, tofu, etc. Thanks to their diversity, it is actually easier to find a restaurant, vendor or stall with good dishes from Bun and Mien than a fine one selling Pho. It is the fact that even the Vietnamese people sometimes cannot find a good place to eat Pho as in each city there are only very few vendors and restaurants have delicious Pho but they are always too crowded and it is really hard to find an empty table there. One of the most popular desserts in Vietnam is sweet soup. From the North to the South there are hundreds types of sweet soup waiting for both domestic and international tourists come and try them. 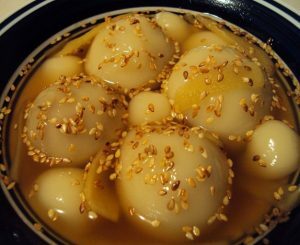 Some kinds of sweet soup only can be easily found in the winter as they have best taste when are served as hot dishes (not cold dishes with ice like most of other sweet soups) such as cassava gruel, black sesame seeds, green bean, rice ball sweet soup, etc. After eating a lot of meat and spicy things to warm up the body in cold weather, a small bowl of hot sweet soup has always been the best choice to finish the meal. As the sweet soup is usually made from nutritious veggie ingredients, it is not only delicious but also good for health. 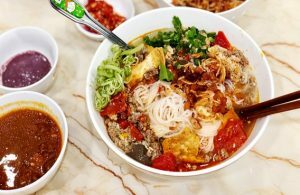 Being hungry while wandering around in Vietnam’s winter? Fried snacks are available in almost every street and ready to serve you. Like many other countries in Asia, fried snacks in Vietnam are diverse, some are sweet, some are salty with meat insides. There are some typical fried snacks here that can be suggested as they are very popular and delightful. With people who love sugary flavor, Vietnamese donut should be considered. This snack is basically a small fried ball made by rice flour with sweet green bean powder inside and covered by sesame seeds. 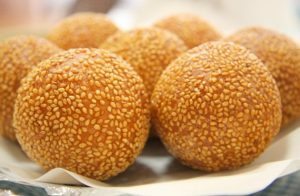 Vietnamese sesame donut can be enjoyed in both hot and cold serving; however, in winter, people are easily attracted by its delicious smell with crispy, slightly sticky and lightly sweet which are shown best when this fried snack is hot. 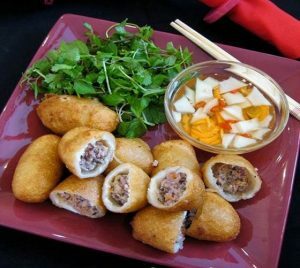 On the other hand, there are also many tasty savory fried snacks which has meat inside such as pillow cake – a fried snack with minced pork, mushroom, kohlrabi, wood ear and glass noodle, savory Vietnamese donut – made with the same ingredients as the sweet one but has minced or sliced pork inside instead of green bean powder, fried bun – has the same recipe like Chinese bun but instead of steaming, it is smaller and fried, etc. Sound too much fat? Don’t worry, the savory fried snacks in Vietnam are usually served with a small bow of traditional sweet and sour dipping source added some pickles. Above is only some typical recommendation for a winter meal in Vietnam. There are still plenty choices for delicious food to enjoy in Vietnam’s winter. Many people may feel uncomfortable with the cold and humid here but Vietnamese cuisine this season promises to satisfy even the most difficult person.